The case against Siôn Jenkins has always been associated with the issue of his qualifications. When he was first charged with the murder of Billie-Jo in March 1997, he was simultaneously charged with deception, and the CV story started to do its work. In the BBC’s Trail of Guilt programme, which presented the police version of how Siôn Jenkins was successfully prosecuted, it is made very clear that for the police the discovery that he had falsified details in his CV was seen as a turning point. It was seen as crucial to the notion that he was guilty of the murder. Untroubled by this spectacular lack of logic, they set about building the edifice of their case, with the CV as a central plank. Locally, the effect of the disclosure was damaging beyond belief. The blaze of publicity in the national press of 15 March 1997 ensured that the story became a focal point of gossip in the area. If Siôn Jenkins lied about his qualifications, he must be capable of lying about anything — so the reasoning went. If he said he didn’t murder Billie-Jo, that denial was just as likely to be a lie. And so the poison was encouraged to spread. There was intense speculation about the detail of what had been falsified. Chinese whispers soon made sure that it seemed as if Siôn Jenkins had no qualifications at all, that he was somehow an impostor, pretending to be a teacher. They contemptuously dismissed the fact that (in common with huge numbers of individuals currently teaching in schools) he had a teaching certificate, a perfectly respectable qualification. Long before the case ever came to court the legend of the teacher who lied was firmly established in East Sussex and further afield. By the time the national media did its work in the wake of his trial in July the following year, Siôn Jenkins’ reputation and credibility had been destroyed. Any later appeal against conviction had, effectively, already sustained serious damage. Siôn Jenkins did — wrongly — falsify certain details on his CV. However, the police chose to withold a very significant fact. 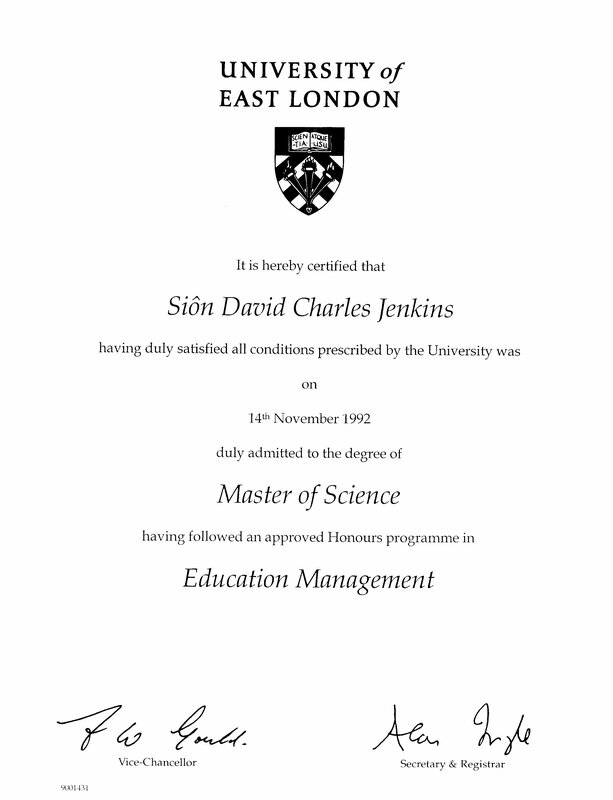 Siôn Jenkins had an MSc in Education Management, properly acquired from the University of East London in the year he was appointed deputy Headteacher at William Parker School. Regardless of any other flaw in his CV, this was the truth. The fact casts a very different light on the picture presented by Sussex police, both at the time of the investigation and subsequently. The story loses much of its impact when it becomes clear that this man was appropriately qualified to hold the post he had held. By choosing not to disclose what is a verifiable fact, the police themselves were indulging in a kind of deception. Why? The question prompts some serious consideration. The CV story gives a deeply disturbing insight into the workings of Sussex police and the integrity of their methods.